My mum was born in 1946 in South Australia. 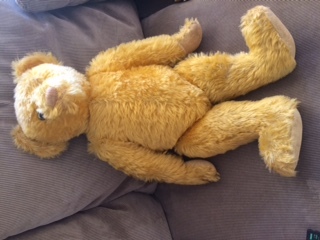 All that I really know is that this bear was very precious to her - when my brother and I were growing up he was up in the top cupboard pretty much in the condition he is in now. We would only ever catch glimpses of him occasionally She would not allow us to ever touch him and he didn't go on display until we had left home. Our mum was very generous and kind and it was unusual for her to be so strict but it was one rule that she never let us break so we knew he must have been very special to her. I know nothing else about him, my mum passed away 6 years ago and my dad earlier this year and I regret never asking her what made him so special to her (other than the obvious fact he is beautiful). He's obviously been well loved... he's missing an eye and his fur is somewhat patchy. He stands at 70cms high and is jointed. I don't really know how to describe the material of his feet and hands other than to say its a bit like a linen or cotton that was obviously coated with something - most of which whatever the coating was has come off. If anyone has any idea I would really appreciate it. As soon as I saw your photo I thought Alpha Farnell because of the colour of his nose & the size & shape of his ears. Found an image on Google search, but couldn't seem to include it here for you. Hope this helps. Nice to see another Aussie on the site.